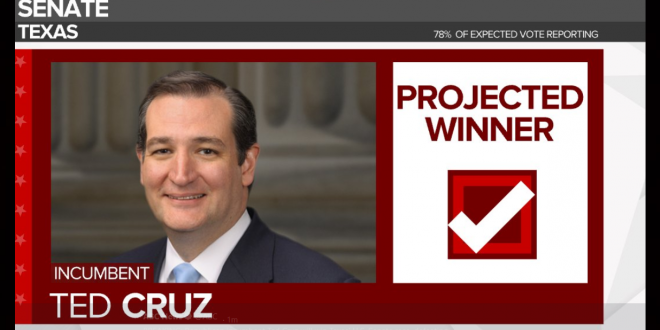 TEXAS: Ted Cruz Narrowly Defeats Beto O'Rourke - Joe.My.God. Republican Ted Cruz of Texas is projected to win re-election to a second term in the U.S. Senate, emerging victorious from the toughest political fight of his career, according to NBC News. Cruz overcame significant deficits in fundraising and enthusiasm to defeat Democratic Rep. Beto O’Rourke in one of the most closely watched races in the country. Texas is solidly Republican statewide, but in O’Rourke Cruz was confronted with a telegenic young opponent who electrified Democrats nationwide. Despite trailing Cruz in the polls throughout the race, O’Rourke’s campaign raised a record-setting $60 million through the end of September, nearly three times as much money as Cruz’s campaign raised.